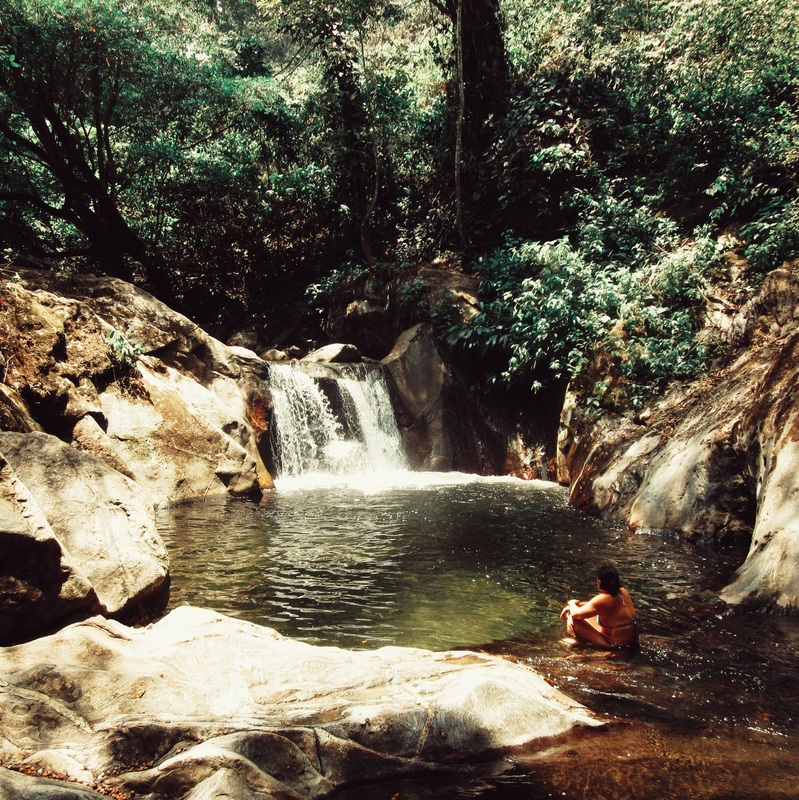 So, we took a trip to the Sierra Nevada of Santa Marta to escape the heat of the coast. Close to the mountain village Minca there is a wonderful spot called Pozo Azul. The perfect place to cool down! Tell us about Pozo Azul, por favor! Pozo means well or waterhole in spanish and that’s exactly what Pozo Azul is. It’s a series of pozos connected by small waterfalls. The water is cool as it comes straight from the mountains, a wonderful treat in this tropical hotness. The water is green and not blue as the name misleadingly claims but don’t let that little detail keep you from going. The green water is both clear and super beautiful! And did I mention that the whole place is surrounded by incredible lush forest? Huge trees hover over the pozos, shading the whole place and keeping it nice and cool for you. Thanks trees! You can even jump off the surrounding cliffs into the water if you dare. Remember to check that your landing spot is deep enough! Okay, now that I have convinced you to go, I will tell you how to get there. Pozo Verde wasn’t a good enough name I guess! First you have to get to Minca and there are two ways to do that. In collectivo (shared ride) or with a motortaxi. Both cost the same, 3 USD/7000 COP, but each has it’s advantages and disadvantages. Motortaxi is faster and less bumpy as it can manuever between the holes in the road, however holding on to the bike gets tiring after a while. Another thing you have to be aware of is that it’s actually illegal for guys to use the motortaxi because of too many robberies by guys on motorbikes in the past. You are of course only guilty if you get caught 🙂 so I went ahead and took the bike anyway and I had no problems. The drivers only carry one helmet for themselves but if you ask they will let you wear it. I advice that you do so. 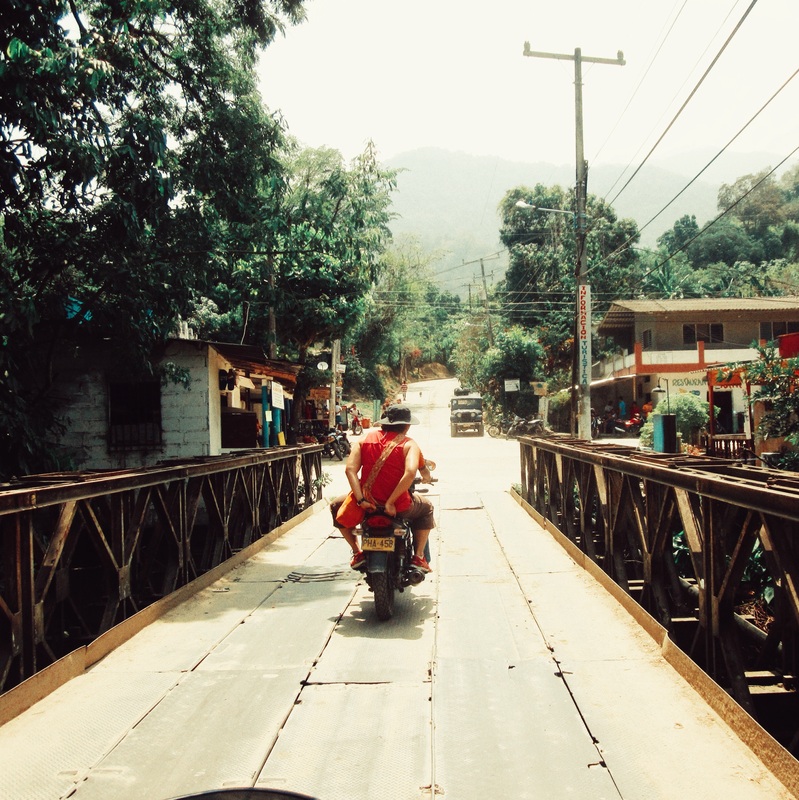 The motortaxis to Minca can be found in Yucal in Santa Marta. You can take the bus there (0,5 USD/1400 COP), it’s close to the Buenavista shopping center. If that sounds too risky for you then luckily there is another option. You can take a car from the mercado in Santa Marta (Calle 11). The place is a big chaos of people and animals so just ask someone: “Carro para Minca?” They will point you in the right direction. The cost is the same as the motortaxi but it’s a slower and much bumpier ride. Once you reach Minca (45-60 minutes) another choice awaits you. 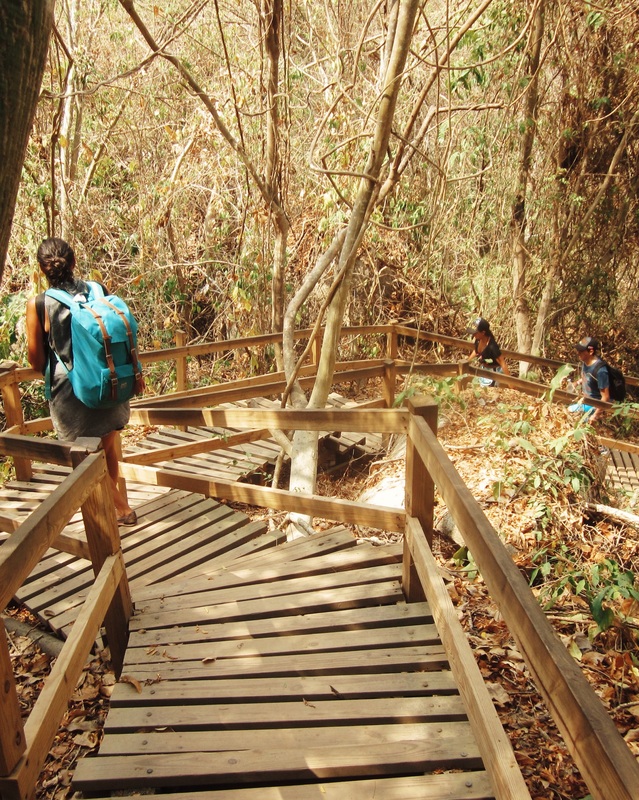 You can either proceed on foot to Pozo Azul or take a motortaxi for 2 USD/5000 COP. If you took a motortaxi from Santa Marta the total price should of course be 5 USD/12.000 COP, no more. The ride is about 15 minutes long and the walk is 30 minutes or more. You can easily walk the bit but bear in mind that it’s uphill and it’s usually very hot. That just makes the destination that more delicious though! Bring your own snacks and drinks if you’d like but it’s also possible to buy fruits, chips, water and soda from a man in a hammock right by the bridge at Pozo Azul. I recommend you try the organic bananas, only 200 COP a piece! Also, bear in mind that Pozo Azul is just straight nature, there’s no private place to change into you bathing suit. When you are done enjoying the refreshing water you can take the walk back to Minca which is much nicer when you are cooled off and going downhill. In Minca you can find lots of eating places and hostels if you aren’t ready to leave the fantastic nature. I recommend that you at least take a good lunch to restore your energy. A menu of the day at a local restaurant will cost you 3,5 USD/8000 COP. To get back to Minca take the collectivo or the motortaxi, the price is still 7000 COP. 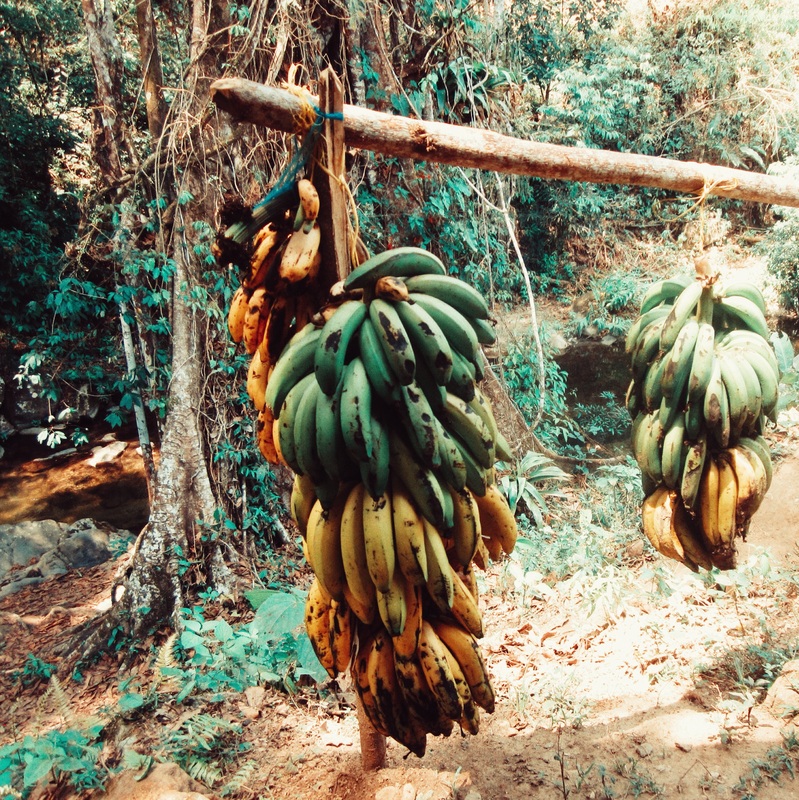 Organic bananas fresh from the source! 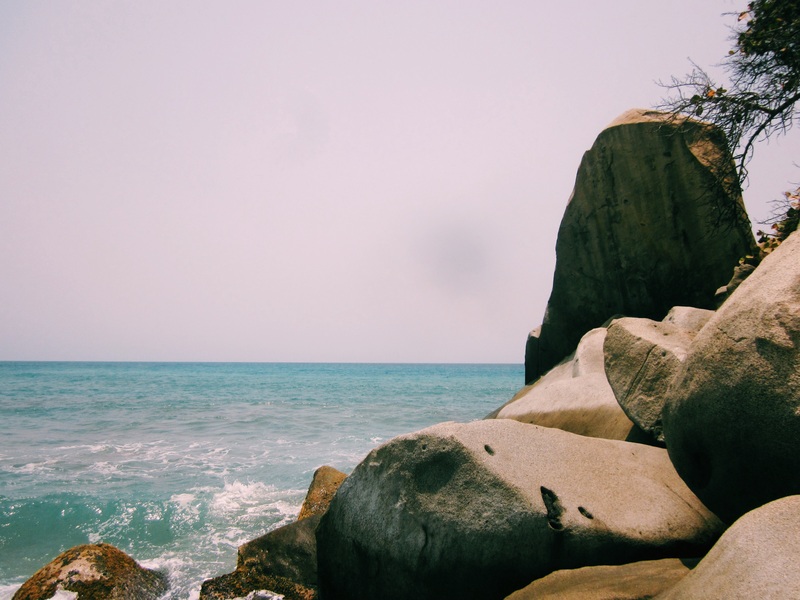 Tayrona National Park: A low budget guide! 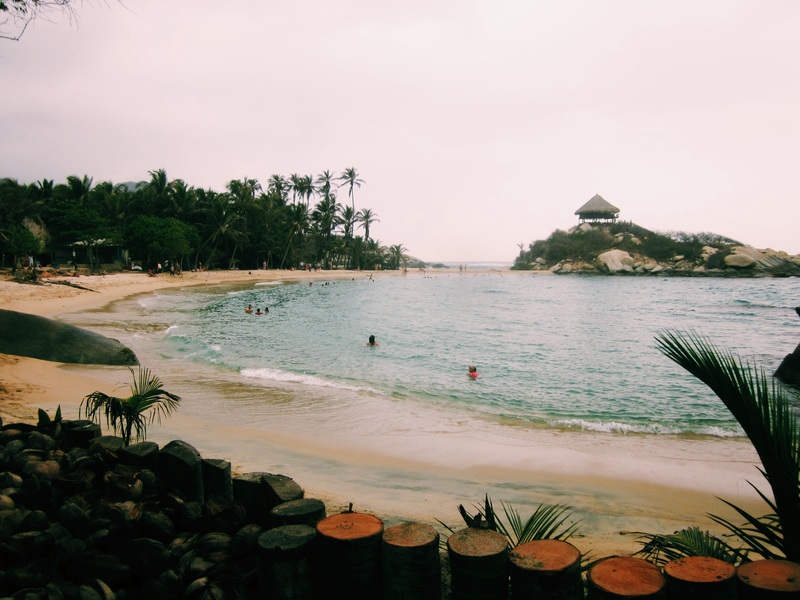 La Agencia Travelers went to investigate just how cheap it’s possible to do a two night stay in the amazing Tayrona National Park near Santa Marta :D.
Tayrona is a protected national park located just an hour from Santa Marta on the Caribbean coast of Colombia. It’s packed with incredible picturesque nature, like white sand beaches, turquoise blue waters, jungle covered mountains, creeks, rivers and ruins. It also portrays a wide range of wildlife from Caiman aligators to Red-Howler monkeys. Basically it’s an awesome primordial adventureland. It looks like a dream, but it’s real! It must be packed with people if it’s that awesome! It’s not. The rather expensive entrance fee plus the high prices on food and beverages inside keep many travelers from ever going. This is great as it means you can enjoy the scenery mostly undisturbed. 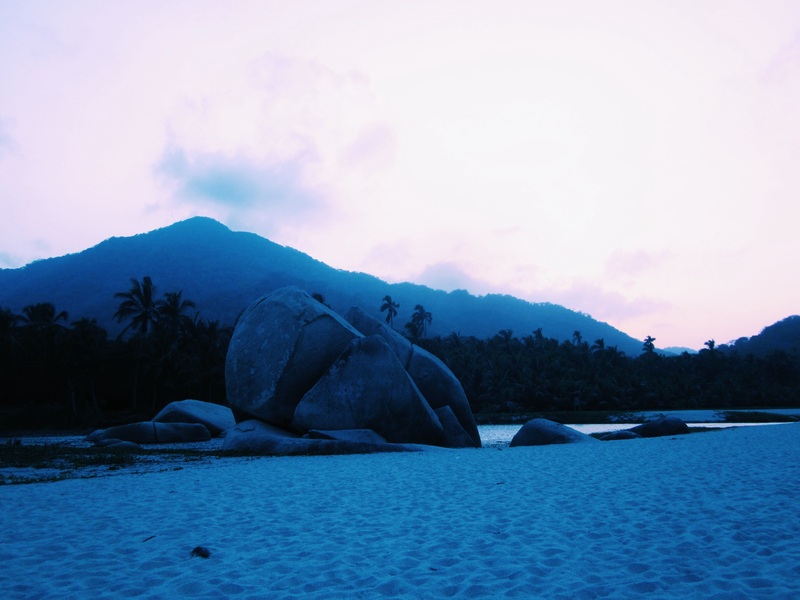 However, we want all travelers to have the possibility of experiencing Tayrona. That’s why we went there and found out the cheapest way to spend two nights at the park! This budget is for two persons spending two nights in Tayrona. There you have it, the 100-dollar Tayrona budget! Yes, I did notice that the sum of the budget items only adds up to 96 USD. It just means that some dollars were lost in the rounding up or down of the digits ;). Doesn’t this make you want to go? Three loafs of bread, four cans of sardines, a pack of mayonnaise, a pack of strawberry jam, a bottle of salt, three advocados, two tomatoes, four eggs, cream cheese, chocolate cookies, salt crackers, six liters of water, two guyaba manzanas, two grenadillas, one zapote and one pineapple. We weren’t sure if it was possible to cook inside the park, so we decided to have sandwhiches for every meal. It turned out that there was some sort of kitchen where we camped so we could have brought stuff to cook. The sandwhich plan actually worked out pretty well though. It was not luxurious but you have to remind yourself that you are in Tayrona to experience the incredible nature, not to eat gourmet food. The food we brought was more than enough, however the six liters of water did not suffice. Due to the heat and the trek to and from the beaches you should bring at least two liters of water per person per day. You can of course buy water inside the park but it’s more than twice the price of the stores in Santa Marta. The ticket is the most expensive item in the budget. Foreigners pay the highest price, although locals don’t pay much less. If you really want to save a lot, you can bring your student id (if you happen to be a student of course). The price for students is just 3,5 USD/8.500 COP and this applies even if you are a student outside of Colombia. The hammocks are the cheapest option. They are quite comfortable and are covered by a mosquito net but don’t expect to get a great nights sleep. Even with the net you have to wear a heavy coat of DEET to keep the mosquitoes from bothering you. The cheapest transport to Tayrona is the public bus which departs from the intersection of Calle 11 and Carrera 11 in Santa Marta. It’s right at the market and it’s easy to get lost so ask around. Once you are inside Tayrona you can take a small bus to the start of the trek which is recommendable. Otherwise you would have to walk twice as much in the smoldering heat! The “trek” is not that difficult, but it’s still hot! So there you have it folks! 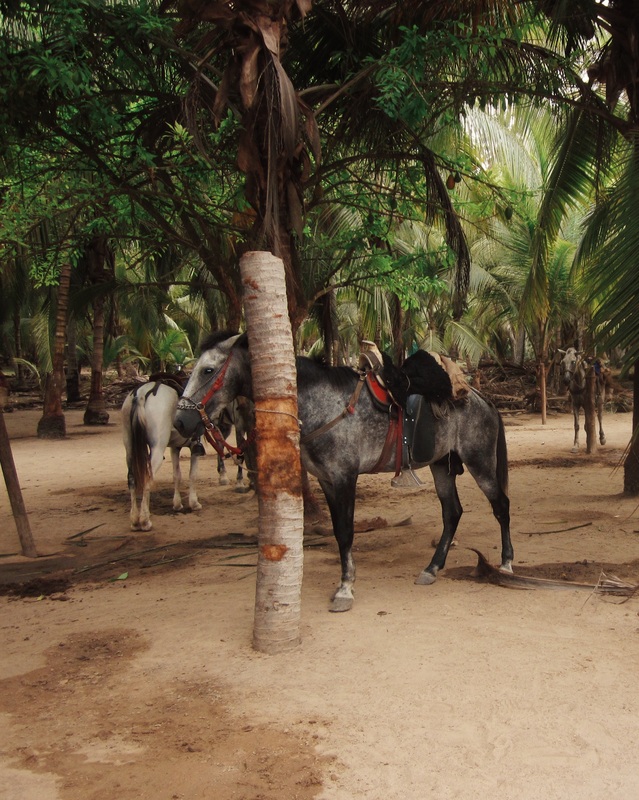 How to enjoy the beautiful Tayrona Park on a budget. We hope you get a chance to go! If you already went and have more awesome low budget tips, please share them with us in a comment below :). Is it worth flying with VivaColombia? First things first, La Agencia Travelers is not sponsored by VivaColombia Airlines. This is not an advertisement! Then you need to get out more because this is all over the SA-travel grapevine! VivaColombia is one of the VERY few low-cost airlines in Latin America. They cover all the major cities in Colombia, including the Caribbean coast, and they fly to Panama City, Quito and Lima for as cheap as 100 USD. If you hit the right dates, you can often get a flight for the same price as a busticket to the same destination. This is GOLDEN because as anybody who has traveled in South America would know: Distances are LONG and the quality of bus companies varies to say the least! Same price as the bus? Getouttahere! No, it’s true. But! You need to keep an eye out for promotions on the VivaColombia website. Three weeks ago, when I needed to get from Bogotá to a new job in Medellín with only a few days notice, I was really lucky. First I checked the bus prices, which seem to range between 35-55.000 COP (15-23 USD) for Bogotá-Medellín. Then I checked the prices at VivaColombia and I got a ticket for 70.000 COP (30 USD). 50.000 for the ticket and 20.000 for my bag. Wait, you have to pay extra for your luggage? It all depends on how much weight you carry. You are allowed to bring one carry-on with 6kg/13lb, anything extra you have to pay for. Don’t get discouraged, it is still very affordable. You have the option to bring an extra 12kg/26lb bag with you in the cabin for a fee of 20.000 COP (8.5 USD). Or, for the same price, a 20kg/44lb bag that you check in. If you have special luggage like musical instruments this will cost extra too. Think about this for a minute. How much is an hour worth to you? This is not an hour at a miserable deskjob we are talking about. This is an hour of your travel time, your adventure time, maybe the best time if your life. You have to take account of that when you calculate if it is worth taking the plane over the bus. I flew from Bogotá to Medellín in one hour and seven minutes. The bustrip takes 9-10 hours. Do the math! 1. When you fly into Colombia from another country you have to pay a fee of 15 USD at the check-in counter in the country of departure. 2. If you want your ticket to be cheaper, print it yourself and check in online up until four hours before departure. 3. No seats are assigned, you just choose one when you enter the plane. If you want to sit at the emergency exit, you have to be fluent in spanish. 4. Pay attention when you choose the extra bag services on the website. I chose the 12kg bag option without realizing I then had to take the bag with me into the cabin. The check-in lady almost didn’t let me in because my bag was too big. Choose the 20kg option, it’s the same price! So, my advice to you is: Skip the bus! The plane is faster, safer and now also almost cheaper. Welcome to La Agencia Travelers! This is the first post EVER from La Agencia Travelers so let me use this opportunity to tell you who we are, what we do and all that good stuff.